Tametsugu (為継) worked in the beginning of the Nanbokuchô era and was originally from Echizen Province (越前国). While there is some controversy as to whether he was, in fact, the son of Gô Yoshihiro (江義弘) and a student of Etchû Norishige (越中則重), that seems to be the prevailing theory. I am going to devote the initial part of this treatise to the major smiths who had either a direct or indirect influence on Tametsugu (為継) and, hopefully, shed some light on this theory. When we consider the founding of the Sôshû school (相州), we must start with Shintogo Kunimitsu (新藤五国光). Kunimitsu (国光) was the son of Awataguchi Kunitsuna (粟田口国綱) who died at the age of 93 in the seventh year of Kenchô (建長) (1255). In the Daizan it says that Kunitsuna’s (国綱) son was born to him in his old age and separated from him at the age of six. That would make the birth year of Shintôgo Kunimitsu (新藤五国光) 1249. This loosely ties in with Dr. Honma’s belief that rather than there being a direct lineage of Sôshû (相州) smiths, i.e. Kunimitsu (国光) teaching Yukimitsu (行光); Yukimitsu (行光) teaching Masamune (正宗); Masamune (正宗) teaching Norishige (則重); etc., the more likely situation was that Masamune (正宗), Norishige (則重), Go Yoshihiro (江義弘), and even Yukimitsu (行光) were all fellow students of Shintôgo Kunimitsu (新藤五国光). They may have been students at varying times and for varying periods of time. Since we have dated works by Kunimitsu (国光) as late as the Gentoku (元徳) era (1329-1331), this is entirely possible. In the case of Norishige (則重), this theory is supported by the reliable source material Kiami-bon that was published in the first year of Eitoku (永徳) (1381). It pointed out that Norishige (則重) was a student of Shintogo Kunimitsu (新藤五国光). Further, Norishige’s (則重) extant works are known with the respective dates of the third year of Shôwa (正和) (1314), Gen-ô (元応) (1330). In addition, Kôzan oshigata has a record of a blade having a date in the Enkei (延慶) era (1308). 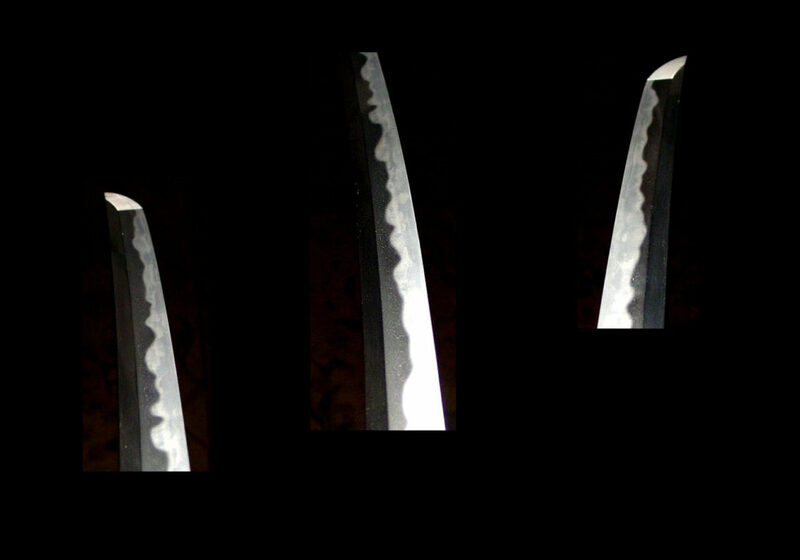 The blade with the date of the third year of Shôwa (正和) (1314) has the surface texture (hada) appearing at first glance like Yukimitsu’s (行光) instead of the so-called matsukawa-hada for which Norishige (則重) is famous. This would tend to indicate that this blade was probably made at the beginning of Norishige’s (則重) career. These points are made in an article by Koizumi Tomitaro in the NBTHK Journal. Nihontô Koza further references the Kotô Meijin Taizen as stating that Norishige (則重) was born in the second year of Shôô (正応) (1290) and that he died at the age of 77 in the fifth year of Jôji (貞治) (1366). This would make Masamune (正宗) 28 years older than Norishige (則重). Masamune’s (正宗) generally accepted dates are from approximately 1262 to 1343. Nihontô Koza cites a reference that Masamune (正宗) died at the age of 81 years old in the second year of Kôei (康永) (1343). Also, if we do the math, we will find that Masamune (正宗) was only 13 years the junior of Kunimitsu (国光), yet no one disputes that they had a teacher/student relationship. When we consider the short life span of Go Yoshihiro (江義弘), these theories become even more interesting. The Nihontô Koza says that Go Yoshihiro (江義弘)was 21 years old around the Gen-ô era (元応) (1319-1321) and that he died at the age of 30. This means that he was born in 1300 and he passed away around 1330. 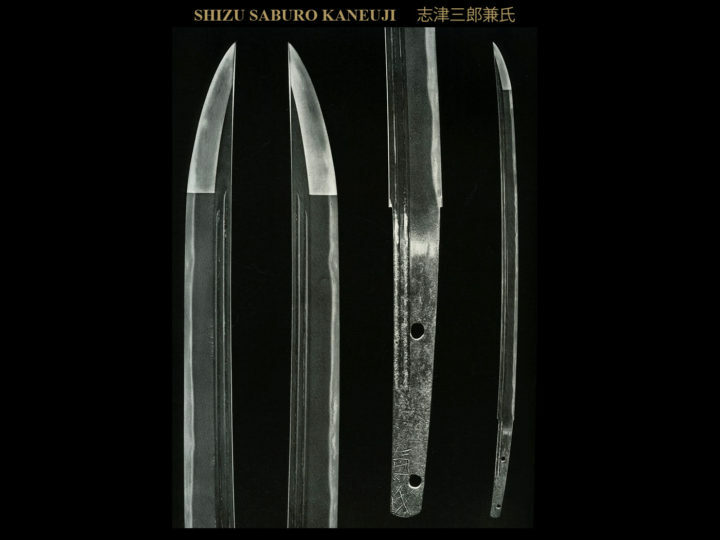 If we assume that by the age of fifteen he was learning to make swords, it is easy to see how he could also have been under the direct influence of Kunimitsu (国光), Masamune (正宗), Norishige (則重), and Yukimitsu (行光) either directly or indirectly. The point is that we do not have to button-hole any of these smiths as being the students of only one of these great smiths. Rather, we can make the case that they had overlapping contemporary lives and worked, experimented, and learned together. There is a scarcity of detailed information about Tametsugu (為継), but based on the known working dates we have from his few remaining signed pieces, I feel confident that we can place his life approximately between 1315 and about 1380. As we know, his father, Go Yoshihiro (江義弘), died at the young age of 30 in 1330. If we assume that Tametsugu (為継) was at least 15 years old at the time of his father’s death (old enough to begun studying the making of swords with his father), that would mean that Tametsugu (為継) entered the Norishige Kei (則重系) when Norishige (則重) was about 40 years old and in his prime. When we examine the works of Tametsugu (為継), we can easily see the influence of the Sôshû (相州) school and particularly the forging characteristics of Norishige (則重). We find the areas of dark steel associated with the swords of the “Northern” area of Honshû and occasionally we find areas of matsukawa-hada for which Norishige (則重) is famous. When describing the works of Go Yoshihiro (江義弘), Albert Yamanaka made the following comments about Tametsugu (為継). He wrote, “…Of the very few smiths that followed YOSHIHIRO and his style, probably the most outstanding and whose works we often encounter is that of TAMETSUGU and in many cases, the better of TAMETSUGU’s works are passed off as YOSHIHIRO, though actually, there is a world of difference in the skill of these two smiths, like the sun and the moon”. 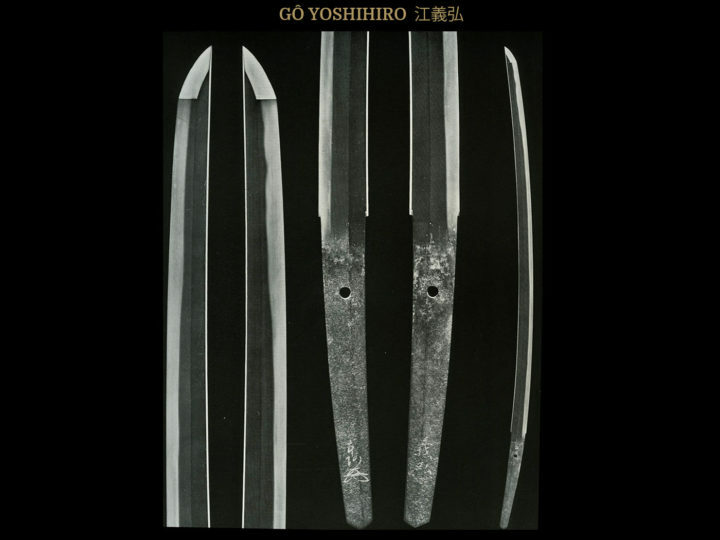 Albert Yamanaka further states when describing the works of Tametsugu (為継); ” All blades made by this smith are very similar to those of NORISHIGE though slightly inferior”. These two descriptions offered by Albert Yamanaka might, at first glance, seem to be unflattering. However, when you consider that Yamanaka considered Tametsugu (為継) to be “slightly inferior” to Norishige (則重) and of less skill than Go Yoshihiro (江義弘), these comments can be construed as praise indeed. To be “slightly inferior” to Norishige (則重) and of “less skill” than Go Yoshihiro (江義弘), two of the greatest smiths in the history of Japanese sword making, and to further say that Tametsugu’s (為継) better works are often passed off as being the works of Go Yoshihiro (江義弘), is high praise indeed. All things are relative and must be taken in their entire context. When we study the history and genealogy of sword smiths who lived 650 or more years ago, we have very few facts to go on and must rely heavily on old texts that were often written hundreds of years after the smiths died or on old oral traditions. Fortunately, we do have one source of reliable information that many smiths left for us, i.e. some of them occasionally chose to put dates on their blades. Among Tametsugu’s (為継) remaining works there is one dated in the second year of Enbun (延文) (1357) and one dated the second year of Ôan (応安) (1369). They are both signed Echizen no Kami Fujiwara Tametsugu (越前守藤原為継). There is also a work dated as being made in the seventh year of Ôan (応安) (1374). This example, however, is signed Noshû Jû Fujiwara Tametsugu (濃州住藤原為継). From the dates on these three blades and the change in the location of manufacture, we can surmise that at some point between 1369 and 1374, Tametsugu (為継) moved from Echizen Province (越前国) to Akasaka (赤坂) in Mino Province (美濃国). If we go back and reference the probable working dates of Etchu Norishige (越中則重), we can draw the conclusion this would have been about the time that Norishige (則重) stopped working so Tametsugu’s move at that time from Etchu Province (越中国) entirely logical. Since this period (1369-1374) was also near the end of the working career of Shizu Kaneuji (志津兼氏), there is even the remote possibility that Tametsugu (為継) also spent some amount of time working with this smith who is also considered to have been one of the Masamune Jittetsu (正宗十哲), ten students of Masamune (正宗). Thus, we have the strong possibility that Tametsugu (為継) studied with and was influenced by three of the greatest smiths of his time. However, a more likely reality is that he moved to Mino (美濃) in time to work with the second generation Kaneuji (兼氏) as Shizu Kaneuji (志津兼氏) by that time was probably too old to do much teaching. 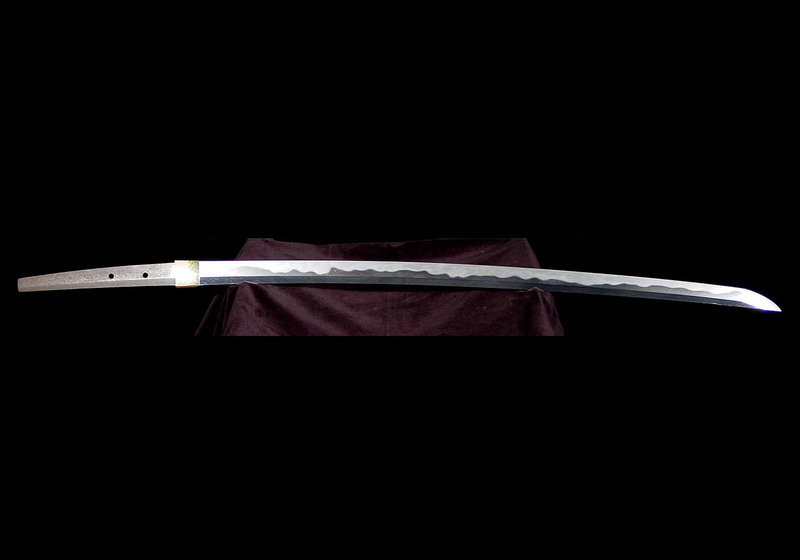 The sugata of this sword is very typical of the later part of the Nanbokucho era. It differs slightly from the works of Yoshihiro (義弘) and Norishige (則重) by its wider mihaba, elongated kissaki, thin kasane, and lack of any narrowing from the moto-haba to the kissaki-haba. The flowing itame hada with areas of mokume hada and even a few areas of o-mokume hada and the presence of a few areas of a “blackish” darker steel point to a combination of Mino(美濃) traits mixed with the steel of the Northern region of Etchu/Echizen (越前／(越中). Throw in the jigane that is covered in ji-nie; a hamon that is gunome-midare with a slight mixing in of ko-notare; ashi and yô activity here and there; streaks of sunagashi; a habuchi that is well covered in nie and you have a strong Sôshû (相州) influence, much like the works of Norishige (則重). Measurements: Length: 70.1 cent. ; Curvature: 1.0 cent. ; Width at Base: 2.9 cent. ; Width at the Point: 2.1 cent. ; Kissaki Length: 4.6 cent. 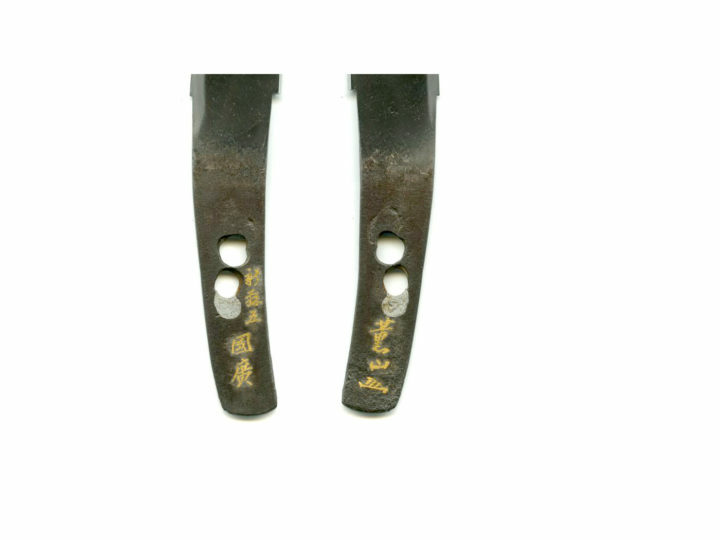 ; Nakago Length: 21.4 cent. ; Nakago Curvature: Slight. Characteristics: The construction is shinogi-zukuri with an iori-mune. The shinogi is somewhat wide. The blade is deeply curved and there is an ô-kissaki. The kitae is itame with a slight mixing in of mokume, and there is also a slight mixing in of ô-hada. The jigane is covered in ji-nie. The hamon is gunome-midare with a slight mixing in of ko-notare. There is ashi and yô activity here and there. There are repeated streaks of sunagashi. The habuchi is well covered in nie. There is slight kinsuji activity as well as tobiyaki. The bôshi is heavily brushed and slightly ko-maru. The nakago is ô-suriage, and the end is cut off straight across. The yasuri on the omote are kiri, and on the ura from around the middle of the nakago and below, they are sujikai. There are two mekugi-ana, and the blade is mumei. Explanation: Tametsugu is said to be the son of Gô Yoshihiro (郷義弘), and later the student of Norishige (則重); however, based on the period of his activity, these explanations are unreasonable, which is an area for further study. There are oshigata of Tametsugu’s works that are dated the second year of Enbun (1357) and the second year of Ôan (1369) with the signature “Echizen no Kuni Fujiwara Tametsugu” (越前国藤原為継), and there is an extant work with a seventh year of Ôan (1374) date that is signed Noshû jû Fujiwara Tametsugu (濃州住藤原為継). Because of these inscriptions, we can assume that he moved from Echizen to Mino sometime between the second year of Ôan and the seventh year of the same era. Regarding his style of workmanship, the jigane is well covered in ji-nie, the itame hada is prominent and flowing, and there is a mixing in of blackish steel. The ha is notare based with a mixing in of gunome, and there are conspicuous streaks of sunagashi. The bôshi is heavily brushed. All of these characteristics give the feeling of a mixing together of the Northern Area’s and the Mino’s styles of workmanship. This katana has a wild midare-ba that is powerfully covered in nie. 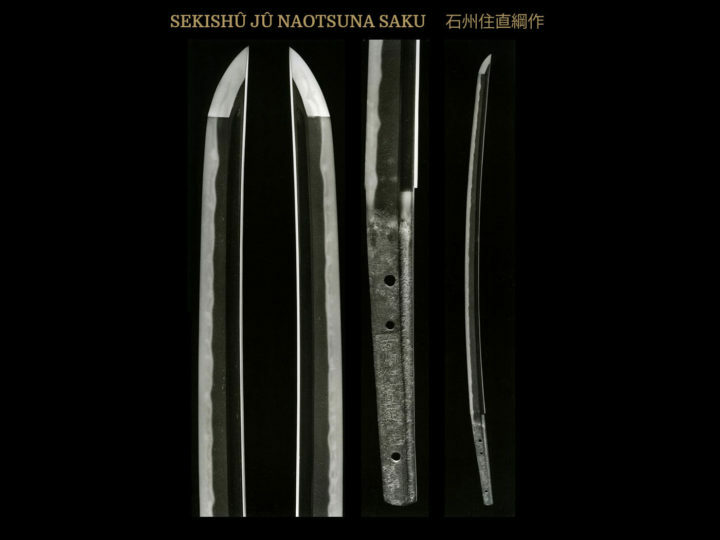 Although the blade is mumei, this is a work that clearly displays the characteristics of this same smith. You will see that in the “Explanation” section of the zufu, the kantei judges express serious doubts as to the validity of the common theory that Tametsugu (為継) was, indeed, the son of Go Yoshihiro (江義弘)and the student of Etchu Norishige (越中則重). While I would never think of setting my opinions above those of these learned gentlemen, I choose in this instance to follow the prevailing theories that were put forth by Honma Sensei, Koizumi Sensei, and others. I hope that the chronological histories of Go Yoshihiro (江義弘), Norishige (則重), and the others presented in this paper help to substantiate those opinions. At the very least we should all agree that this is certainly an area for further study and not dismiss these possibilities as “unreasonable”. To assist the reader with the many overlapping and often confusing dates of the smiths mentioned in this article, I am attaching a timeline of the six primary smiths to illustrate the relative life-spans of each one as compared to the others.